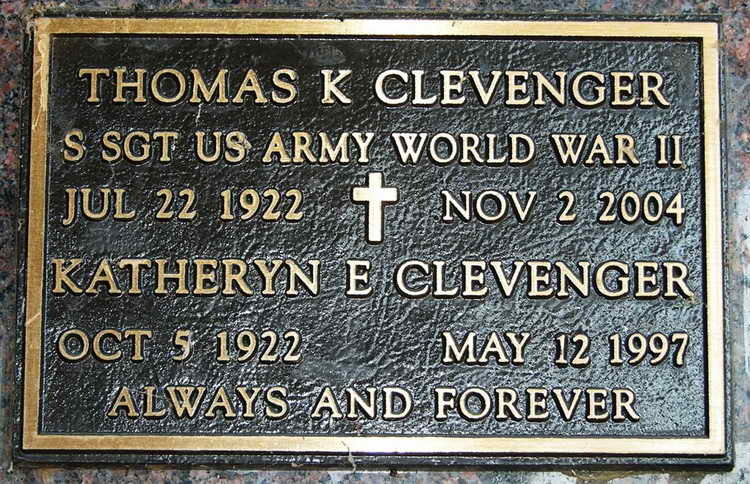 Grave marker for Thomas K. Clevenger in Riverside National Cemetery, Riverside (Riverside county), California. Thomas enlisted in the Army at Fort Snelling, MN on 30 October 1942. The date of his arrival at Camp Blanding is not known as the 1942 Morning Reports for Company F are not available. On D-Day in Normandy T/5 Clevenger was inadvertently jabbed in the buttocks with a bayonet by Ralph Burrus. Ralph stated that they had to have medics take care of a heavily bleeding wound that Burrus described as "bleeding like a stuck ox." That probably didn't count for a Purple Heart. What did count, however, occurred on 1 October 1944 when T/5 Clevenger was "slightly wounded in action" in Holland. He was evacuated to a field hospital and by 2 January 1945 508th rolls and transferred to the hospitals detachment of patients.. But on 27 February 1945 he was transferred back to Company F from the 3rd Replacement Depot. His military decorations include the Purple Heart and the Bronze Service Arrowhead device awarded for participation in the Normandy assault.